Don’t miss them at the U.S. Capitol on September 11th! 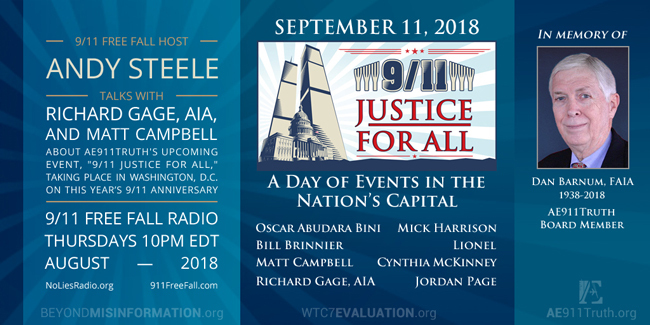 In our most recent episode of 9/11 Free Fall, host Andy Steele is joined by 9/11 family member Matt Campbell and Richard Gage, AIA, to announce “9/11 Justice for All,” AE911Truth’s upcoming day of events in the nation’s capital on this year’s 9/11 anniversary. Richard and Andy also take the opportunity to remember AE911Truth Board Member Dan Barnum, FAIA, who passed away on August 15, 2018. For those of you who are able to be in Washington, D.C., we look forward to seeing you there and we highly encourage you to purchase your tickets for the evening event at Busboys and Poets now, as seating is limited and tickets are $10 more at the door. For those of you unable to travel to Washington, D.C., the 2:00 PM rally at the Capitol and the evening event at Busboys and Poets will be livestreamed on our website free of charge. Please consider making a donation to help us cover the considerable cost of the Capitol rally and travel expenses for our speakers! We’re humbled by and grateful for your support as we attempt to make an indelible mark on the public dialogue during the upcoming 9/11 anniversary.